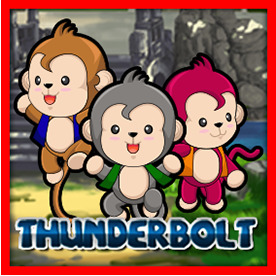 Thunderbolt is a monkey racing game. You have to bet on 2 monkeys that you guess is the fastest. In additional , there are 3 more options for betting, Banker, Tie and Player. Gold Monkey: total bets x100 for winner, except for Banker,Tie and Player. Rainbow Monkey: Substitute for all symbols. Free Monkey: Extra 1 Monkey for winner.